Smith & Wesson M&P9 Shield. Pistol sales are hot in Idaho. Smith & Wesson Shield semi-auto handguns, in 9mm and .40 caliber, are very much in demand here with concealed carry and self-defense customers, and sell for $449. The Sig P238 and P938 are strong movers, too. “We sell the Sigs as fast as we get them in,” Center Target Sports owner Ed Santos said. The P238 commands $535, the P938 $689. For accessories, Center Target Sports has seen a great interest in low-powered optics. The AimPoint PRO and T1 Micro red dot sights are very popular, especially with AR shooters, who are always happy to gobble up quality tactical optics. The only real items that customers are shying away from, Santos said, are long guns and handguns chambered in .22 rimfire. For the fans of the rimfire, there is a fairly obvious reason behind the customers’ aversion to the caliber. 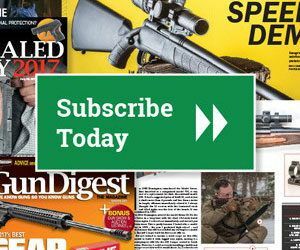 Editor’s note, this article originally appeared in the Dec. 16, 2013 edition of Gun Digest the Magazine.